NEW YORK – Within hours of Archbishop Carlo Maria Viganò’s blockbuster claims that Pope Francis knew about former Cardinal Theodore McCarrick’s history of abuse, the bishop of Tyler, Texas, issued a statement saying he found those claims to be credible, asking that it be read at all Masses on Sunday. “I do not have the authority to launch such an investigation, but I will lend my voice in whatever way necessary to call for this investigation and urge that its findings demand accountability of all found to be culpable even at the highest levels of the Church,” wrote Bishop Joseph Strickland. He went on to include the 11-page testimonial of the former papal ambassador to the United States on his diocesan website. In just over 72 hours since the Archbishop Viganò accusations came to light, a range of statements have been issued that reveal a divided U.S. Church at its highest levels. Cardinal Donald Wuerl of Washington, D.C., also disputed the claims against him in the letter and threw his support behind the idea of an apostolic visitation to investigate how former Cardinal McCarrick’s ecclesial career advanced despite a history of abuse. By Monday afternoon, a statement from Cardinal Daniel DiNardo, president of the United States Conference of Catholic Bishops (USCCB), focused on the need for investigation, saying the letter “brings particular focus and urgency” to that task. 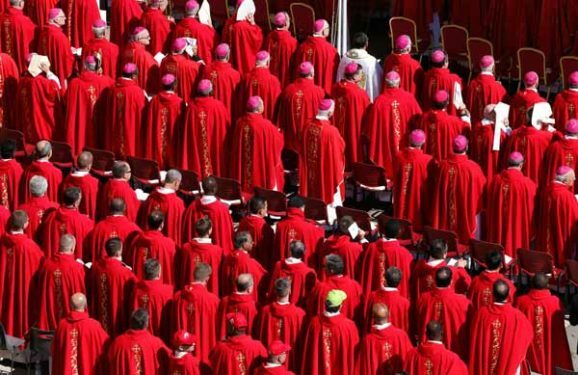 Yet the statement issued by the cardinal was one made on behalf of the USCCB’s executive committee, not the conference as a whole – a fact some observers have suggested may indicate that full unity within the conference doesn’t exist. Signs of factions were evident in statements that have poured forth from other dioceses on Monday and Tuesday, which seemed to emphasize the integrity of Archbishop Viganò over that of the pope. Bishop Robert Morlino of Madison, Wisc., while expressing solidarity with Cardinal DiNardo’s statement, directly criticized Francis for failing to provide a direct answer to the allegations in a press conference en route to Rome from his weekend trip to Ireland for the Vatican-organized World Meeting of Families. Bishop Morlino then went on to slam the credibility of journalists, saying that “in the United States and elsewhere, very little is more questionable than the professional maturity of journalists.” He specifically identified the National Catholic Reporter for what he called its bias in covering the Church. Throughout the 1990s, the NCR was one of the first outlets to seriously cover the emerging crisis of clerical sexual abuse. That would ultimately lead to the explosive coverage of the Boston Globe’s “Spotlight” series in 2002, which prompted a national response from the U.S. bishops. Bishop Robert McElroy of San Diego, Calif., also mentioned briefly in the Archbishop Viganò missive, issued the most strongly worded statement, condemning his brother bishops for allowing the recent allegations to divide the conference and detract from the ultimate goal of providing healing to victims. “We as bishops cannot allow the pathway of partisanship to divide us or to divert us from the searing mission that Christ calls us to at this moment. We must make public our sinful past. We must engage and help heal the survivors of abuse. We must develop new, lay-governed instruments of oversight and investigation in every element of how we confront sexual abuse by clergy at all levels in the life of the Church,” he wrote.